Today I thought I would write a little about Japanese food. I found another interesting blog with a good description of okonomiyaki, one of my favorite foods and also one of the most famous foods of Osaka. As described in the page I linked to above, onokomiyaki (which can be literally translated as “cook what you like”) is shaped liked a large pancake and contains eggs, dashi, cabbage and other vegetables, and usually pork or seafood of some sort. It is topped with mayonnaise, sauce, aonori (dried seaweed flakes), and katsuo dashi (bonito flakes), and sometimes cheese. 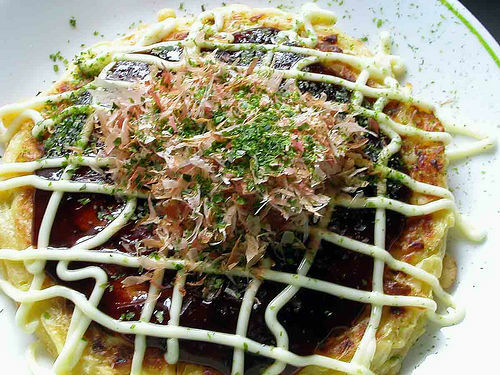 This is Osaka-style okonomiyaki. The two places that are known for their okonomiyaki are Osaka and Hiroshima (sometimes Tokyo, but I don’t think Tokyo’s monjayaki can compare to these other two). Hiroshima is also quite good, and debates can become intense when comparing the merits of Osaka- and Hiroshima-style okonomiyaki (personally, I go with the former). If you are in Osaka, I personally recommend eating at Bonhan (ぼん繁), which has shops in Tenmabashi and Kitahama. Bonhan also does take-out orders.